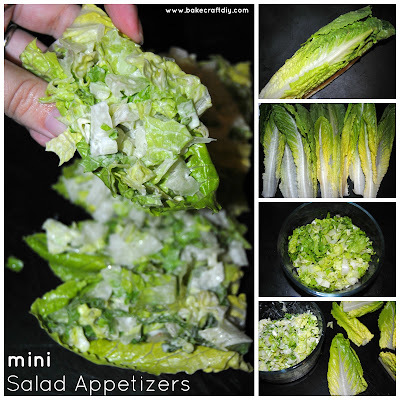 Mini Salad Appetizers are perfect for large or small get togethers. Prep them in advance and all your guests need to do is grab their hand held mini salad! They are great for parties as a quick easy and healthy snack or appetizer and they taste absolutely delicious, maybe because they are are just the right amount of salad. All you need to make the salad appetizers is romaine lettuce and a salad dressing of your choice, we did Ranch on ours. Feel free to customize with diced tomatoes, cheese, hard boiled eggs, or croutons. Start by pulling a part all the lettuce leaves, put the smaller leaves to the side to use as the plate for the salad. Chop the remaining lettuce into small pieces (think shredded lettuce). 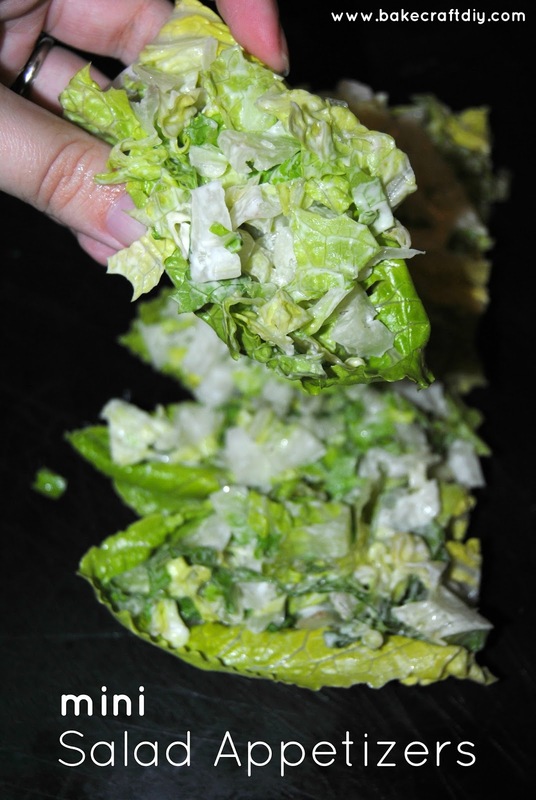 Mix the shredded lettuce with the dressing and add small piles of the dressed shredded lettuce onto the larger leaf. When you're done you'll have mini salads you can pick up and eat in about 3 to 4 bites. Those are such a cute and fun idea! These are such a great idea! I love mini appetizers. Miniature foods are just so much cuter than the full size meals. I can't wait to serve these salads at my next family get-together. Thanks so much for sharing at Inspiration Thursday! Thanks for stopping by, they were a big hit in our house might have to do them for Super Bowl!